With some assistance from her husband, Steven, and 19-year-old daughter, Camille, Kingsolver (Prodigal Summer, 2000, etc.) elegantly chronicles a year of back-to-the-land living with her family in Appalachia. After three years of drought, the author decamped from her longtime home in Arizona and set out with Steven, Camille and younger daughter Lily to inhabit fulltime his family’s farm in Virginia. Their aim, she notes, was to “live in a place that could feed us,” to grow their own food and join the increasingly potent movement led by organic growers and small exurban food producers. Kingsolver wants to know where her food is coming from: Her diary records her attempts to consume only those items grown locally and in season while eschewing foods that require the use of fossil fuels for transport, fertilizing and processing. (In one of biologist Steven’s terrific sidebars, “Oily Food,” he notes that 17 percent of the nation’s energy is consumed by agriculture.) 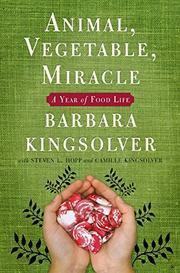 From her vegetable patch, Kingsolver discovered nifty ways to use plentiful available produce such as asparagus, rhubarb, wild mushrooms, honey, zucchini, pumpkins and tomatoes; she also spent a lot of time canning summer foods for winter. The family learned how to make cheese, visited organic farms and a working family farm in Tuscany, even grew and killed their own meat. “I’m unimpressed by arguments that condemn animal harvest,” writes Kingsolver, “while ignoring, wholesale, the animal killing that underwrites vegetal foods.” Elsewhere, Steven explores business topics such as the good economics of going organic; the losing battle in the use of pesticides; the importance of a restructured Farm Bill; mad cow disease; and fair trade. Camille, meanwhile, offers anecdotes and recipes. Readers frustrated with the unhealthy, artificial food chain will take heart and inspiration here.